CHILE DOES NOT HONOR BOLIVIA FREE TRANSIT, failing the treaty they themselves impossed by force! • Justice Minister Héctor Arce asked Chile to understand that the Customs’ strike could generate a humanitarian disaster at the border. In the face of the damage to Bolivian exports via Arica and Antofagasta, by the blockade of customs officials against the country’s transporters, the Agent before the International Court of Justice, The Hague, and former president (2005) Eduardo Rodríguez Veltzé, lamented the ill-treatment of the neighboring country and said that the Government of Chile does not honor the free transit, provided in article six of the Treaty of 1904. “Chile does not honor the obligation to guarantee free transit to Bolivia,” Rodriguez said, through his tweeter account. Then published a video showing a huge line of vehicles stopped at the border crossing between Tambo Quemado and Chungará. “Images for the incredulous,” he quoted. The diplomatic authority added to the denunciations of the Bolivian transporters and of the national Government, on the damages caused by the customs’ strike of the neighboring country and that to date is not solved by its authorities. Bolivia had to sign the Treaty of Peace and Friendship of 1904 against its will, after the invasion of the Chilean army to Bolivian ground. This ended the War of the Pacific. In previous hours, Chilean Foreign Minister Heraldo Muñoz referred to a similar video broadcast by President Evo Morales through his tweeter account, which shows an endless line of trucks waiting to cross the Chilean border, due to the Customs’ strike, a solution that is in the hands [responsibility] of the Chilean government. Muñoz said that video has no credibility and questioned the number of vehicles stopped on the road. 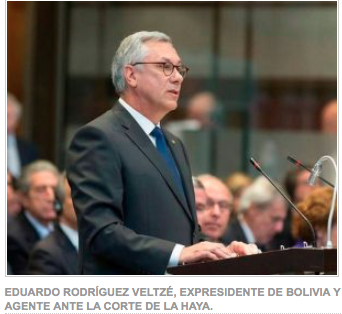 “The Bolivian government has no credibility, it turns out that officially they said that there were 18 thousand trucks, but the minister of the Presidency has said that there are about 140 to 180, which is normal at the border,” asserted the Minister of Foreign Affairs From Chile. For his part, the Minister of Justice, Héctor Arce, asked the Chilean government not to generate a humanitarian disaster on the border. “The #Chile government should understand that the customs’ strike and the inclemency of the climate could generate a humanitarian disaster on the border,” he published through his tweeter account. The workers of the Chilean Customs are exerting an indefinite strike until yesterday [05/31/2017] for six days, causing immense damage to the Bolivian transporters and the exports. This entry was posted in Bolivia, Business, Economics, Social Unrest and tagged 1879 Pacific war, Chile, road blockades, Strike. Bookmark the permalink.